Stripe is one of the most powerful payment processors on the planet and was added as a payment gateway option for our global user base during the newest v11.1 release. What clients love about Stripe is that it processes payments in over 100 different currencies, allows our clients to manage all of their own finances within the site manager, and also provides for free trials… which are a great marketing tool for growing your online community. Once you have set up your Stripe account in the eDirectory dashboard, you will be able to set up your free trial options in your levels and plans. Set number of days, weeks or months under free trial giving members enough time to use the system, and begin to reap the benefits of becoming a member of your community. But I want to monetize my site. Why would I want to offer free trials? By offering free trials – this helps to quickly populate your new directory website with member listings and content. A more populated website with quality content will help build credibility, add value and begin to drive traffic to your site. By populating your site with useful information and displaying an active, popular website, this will help to boost user engagement which naturally leads to paid membership subscriptions and website monetization opportunities. Once your site becomes established, you can then begin to monetize (link to monetizing your website blog) your website and reap the sweet rewards of your investment and hard work. The most important steps to achieving your online revenue goals all start with growing your online directory community. Seeing is believing! With free trials, members can see how it all works, how easy it will be to add great content and get new leads for business. You can even offer special upgrade deals to convert them into paying customers. Once they see how you curate your brand, content, and marketing, they will be more so enticed to stick around and grow with you! By offering a free trial, sign up new members or allow for on-site sign ups via eDirectory’s built in self-service sign up system. Once trial members are given the opportunity to ‘test out’ the functionality of your directory, view the site report activity and see the number of leads coming in or coupons being redeemed, it’s hard to argue the value of the listing and much easier to close the sale or even upsell to a larger plan. When new browsers visit your directory and place a search for data, they expect to find results. 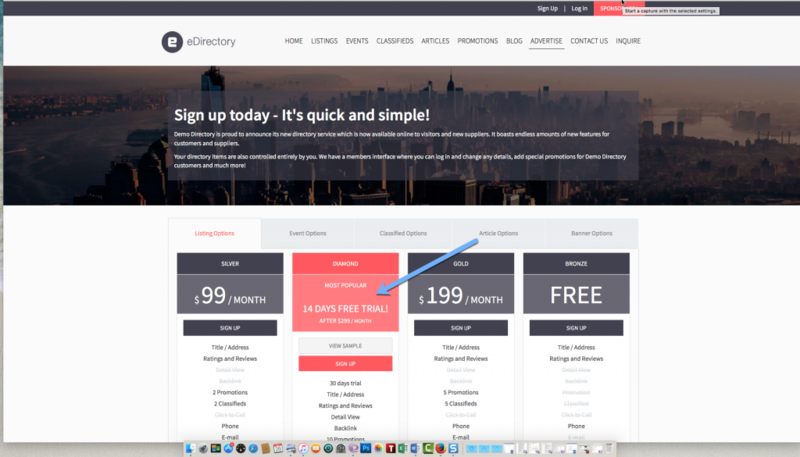 Having your free members create listings and contribute content will show that your directory is active and successful. This is also where the FOMO (fear of missing out) factor comes in to play. If a business owner sees their competitor listed on your directory, they too will want to be listed and become a member of your community to remain competitive. You want your directory to have the inherent appearance of a healthy and thriving website community – a site that provides educational and helpful information. Each member of your community will have the opportunity to add this type of content via listings, articles, events and blog postings. This is not only helpful to visitors, but it’s also great for SEO. So, if you are an existing client and would like the Stripe feature added to your site, simply request an upgrade here, contact your account executive, or chat with us anytime as www.eDirectory.com ! Thank you and happy hunting with free trials for your site! Creates a dialogue – once the free trial has been created, it will create a dialogue between you and your members… you can reach out to collect any feedback or make them a special offer. Once the free trial is over, it also creates the same dialogue allowing directory owners to have a meaningful conversation or learn more about their customer needs. If you’re an active client and would like Stripe added to your site, please click the upgrade request form link to get that started, contact your assigned account executive or create a support ticket. New clients may request a demo call or pick the plan that works best for you and then select LAUNCH right from the pricing page.